Offering you a complete choice of products which include rotary dryer. 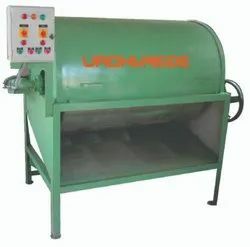 The rotary dryer is a type ofindustrial dryer employed toreduce or minimize themoisture content of thematerialby bringing it in direct contact with a heated gas.The dryer is made up of large rotating cylinder. The cylinderis made in Stainless Steel . Material to be dried enters thedryer and as the dryer rotates, the material is lifted up by aseries of internal fins lining the inner wall of the dryer.When materials fall back to the bottom , it passes throughthe hot gas stream. In the experiment , the gas stream movestowards the feed end from the discharge end .The Rotarydryer is the choice for high throughput capacityapplications involving high moisture, friable, free-flowingcommodity products and by-products.